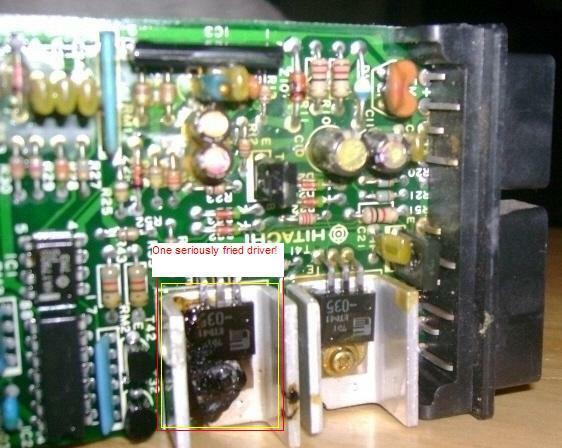 A damaged TCI unit is a common casualty of a failing Voltage Regulator. The higher than expected voltage through the coil-driver transistors can burn them out, leading to loss of spark. The FZR TCI also controls the fuel pump, turning it on and off. If you suspect a damaged TCI box, you can send it to us and we'll do some basic tests - no charge. We'll check it for function on both spark channels and make sure the pump driver works properly. If we can't find anything wrong, we'll let you know and arrange for return shipping (at your expense). If the unit really doesn't work, we'll open it, strip the conformal coating (waterproofing) off the circuit board, and start investigating what is and isn't damaged - it's usually pretty obvious! We'll upgrade both ignition drivers to Bosch BIP373 three-stage Darlington transistors. These are quite possibly the most rugged drivers on the market today, featuring voltage clamping, current limiting, and internal thermal shut-down - if they get too hot, they simply shut down, preventing the kind of damage that made you send the box to us in the first place! Once everything is fixed, we'll re-coat the circuit board and re-install it in the enclosure, then test it one last time. Once your TCI is boxed up and ready to ship, we'll send an invoice for the repair and return shipping. Our fee for a successful repair is US$100. Unfortunately, we can't fix everything; there are a few components (including the microprocessor!) about which we just can't do anything. In these cases, we'll let you know and confirm what you want done with the wreckage, whether to dispose of it here or send it back (at your expense). If we can't fix it, we won't charge you for the attempt. If you're ready to send us a TCI box, contact us for mailing information. It is a common misuse to refer to any motorcycle ignition control box as "the CDI". The ignitor boxes used by most street motorcycles are actually TCI units. This is an important difference, as trying to use CDI and TCI components in the wrong way can lead to costly repairs.